The Dwell On Design Show is not about scooters, but among the pre-fab homes, bathroom fixtures and forward-thinking designs for the homes of tomorrow, you do occasionally see certain bicycles, and in this case a variation of a warehouse cargo scooter called the Nimble. The Nimble scooter is low to the ground, designed to be ridden on the vast smooth concrete expanse of a warehouse floor, but apparently fairly capable as a street scooter also. 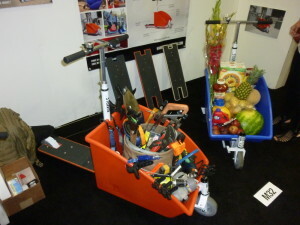 What sets it apart from a standard scooter is the large cargo bin forward of the rider and the handlebars. The handlebars are racked to the front steering wheel, which is some distance ahead of the rider. The hard tires have a flat profile, but Nimble partner John Kim assures me that the scooter can be banked into turns as far as the point where the cargo hopper touches the ground. This cargo hopper also functions as a side stand also so you can stop and park anywhere without unloading or having to do anything else. 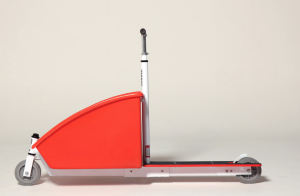 The total weight is 34 lbs, which is heavy for a scooter, but when you take account of it’s main function, shuttling objects back and forth over polished concrete, this is acceptable. Of course on the street it will be much more unwieldy than a pure riding scooter, but again, this has the extra function of being a way to roll cargo along. I imagine the rider would have to be fairly strong and riding it on a sidewalk somewhat difficult. My thought was that given it is a cart that can be scooted, the rider has both options, which is a plus. I can’t see riding one to a fishing location, for example, but I can see riding/walking, with benefits on both sides. The biggest benefit would be on good, smooth, flat, non-curvy pavement, as you said. IMHO, it needs brakes as a front load might make it difficult to control going slightly downhill. (I once took a heavy relative on a wheelchair ride through the San Diego Zoo and found that I couldn’t control the wheelchair under downhill conditions. She had to walk . . . The scooter is pretty heavy, what more if the basket is loaded with other things. On the other hand, I don’t see myself riding with this all the time. It might be more convenient to walk along side the scooter. The basket is surprisingly huge, which is a big plus. the only thing that bothers me about this scooter is the space between the bar and the rear wheel. There’s not enough space to ride around comfortably without thinking of squeezing in. Despite that it’s very convenient for moving stuff around. 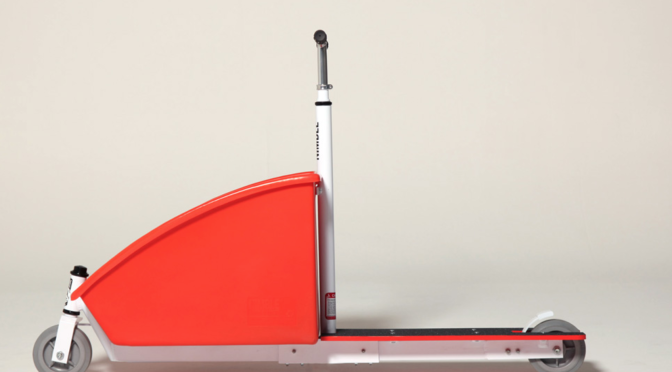 The wheels roll smoothly, and it’s very easy to push or pull around.